Data on the flow of funds for the Indian economy are now available for 2001-2008. Consider the household sector. Between 1994-95 and 2000-01, annual household borrowings rose from Rs24,771 crore to Rs31,778 crore, up 28.3%. But between 2001-02 and 2007-08, household borrowings rose from Rs51,727 crore to Rs1,73,136 crore, up 234.7%. But the rise in debt is no reason for concern. Between 1994-95 and 2007-08, annual household borrowings grew by Rs1,48,365 crore. Yet, annual household assets rose from Rs1,45,502 crore to Rs7,16,250 crore, or a Rs5,70,748 crore increase in the same period. The rise in borrowing is thus 26% of the rise in assets over the period. And in fiscal 2008, household borrowings were just 24% of household assets. It’s also interesting that household borrowing came down in fiscal 2007 and 2008. Even at its peak in 2005-06, borrowing was just 31% of assets. Therefore, the level of household borrowing in India is very low and there’s plenty of scope to increase it. On assets, the trend has been for households to increasingly park funds in bank deposits, which went up to 51% in 2007-08. In contrast, the proportion of surplus in government small savings schemes has fallen drastically. Household investment in shares and debentures have been very volatile and have peaked around market tops, both in 2000 and in 2008, the usual pattern. 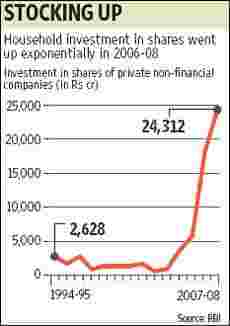 The accompanying chart shows that household investment in shares of private non-financial companies zoomed in fiscal 2007 and 2008, at the height of the boom. But it’s very likely that the data for 2008-09 will show a big drop.